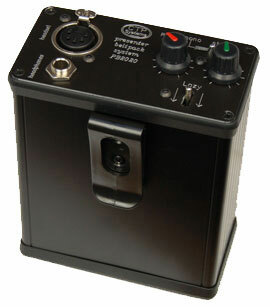 The PB2020 is a battery operated unit designed to provide all audio systems normally required for a remote presenter. 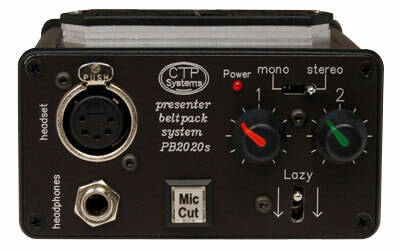 The unit is available in two versions, the PB2020 without a mic cut switch or the PB2020s with a latching mic cut switch. In all other respects the two units are identical. 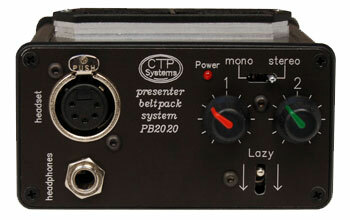 The PB2020 incorporates a high quality, low noise microphone amplifier. 48 volt phantom power is available and switchable. 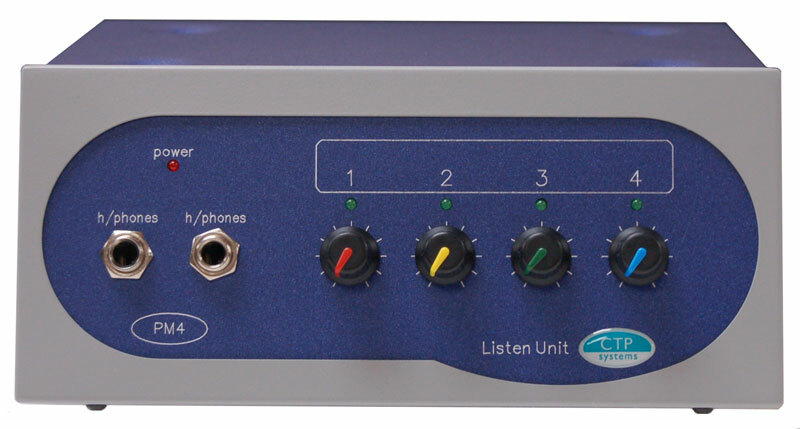 Mic amp gain may be selected in 5dB steps from 15dB to 70dB gain. On keying the front panel 'lazy' key, the presenter's microphone will be silently diverted from programme sound to the unit's 'lazy talkback' output. 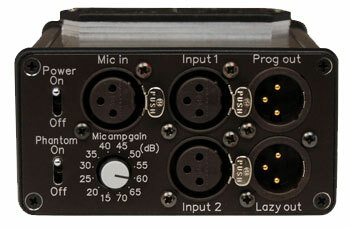 Two XLR headphone/earpiece inputs are provided and may be switched to individual or both earpieces. The headphone socket will operate with either 'A' or 'B' gauge jack sockets. Headset support on 5 pin XLR. The unit has a belt clip which may be removed if required. 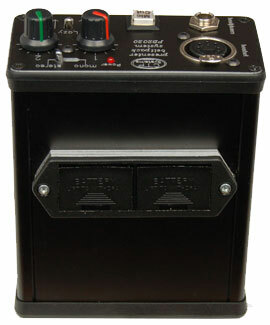 The PB2020 is powered by 2 * PP3 size batteries. When switched on, the power LED will illuminate and when there is approximately one hour's life left in the batteries the power LED will start to flash. When the batteries are dead - no light! Battery life 12 hours+ using alkaline batteries without phantom. Less with! (depends on microphone in use). The PM4 provides the presenter with four self adjustable audio feeds. 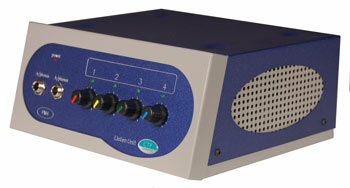 Built in limiter with rear panel adjustable threshold. 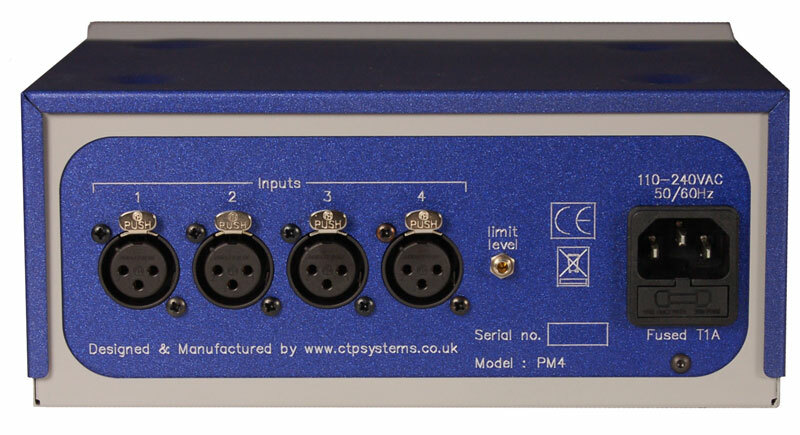 Audio present leds on each input illuminate with incoming audio.